February 26, 2015 – This self-portrait of NASA’s Curiosity Mars rover shows the vehicle at the “Mojave” site, where its drill collected the mission’s second taste of Mount Sharp. The scene combines dozens of images taken during January 2015 by the Mars Hand Lens Imager (MAHLI) camera at the end of the rover’s robotic arm. The pale “Pahrump Hills” outcrop surrounds the rover, and the upper portion of Mount Sharp is visible on the horizon. Darker ground at upper right and lower left holds ripples of wind-blown sand and dust. In this annotated version, Fig. A, labels several of the sites Curiosity has investigated during three passes up the Pahrump Hills outcrop examining the outcrop at increasing levels of detail. The rover used its sample-collecting drill at “Confidence Hills” as well as at Mojave, and in late February was assessing “Telegraph Peak” as a third drilling site. The view does not include the rover’s robotic arm. Wrist motions and turret rotations on the arm allowed MAHLI to acquire the mosaic’s component images. The arm was positioned out of the shot in the images, or portions of images, that were used in this mosaic. Curiosity used its drill to collect a sample of rock powder from target “Mojave 2” at this site on January 31, 2015. 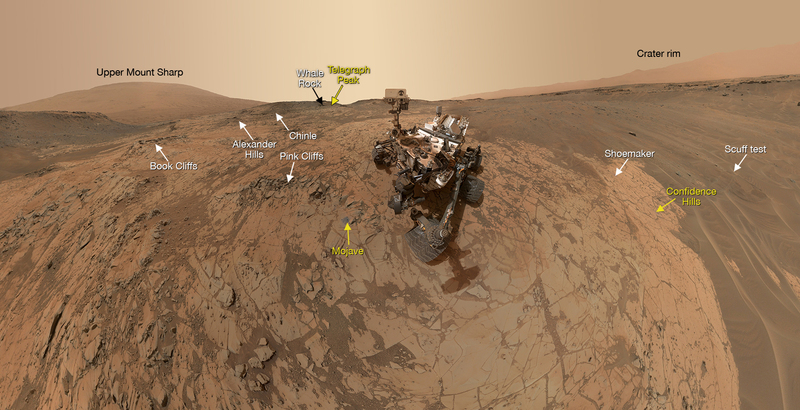 The full-depth, sample-collection hole and the shallower preparation test hole beside it are visible in front of the rover in this self-portrait. The Mojave site is in the “Pink Cliffs” portion of the Pahrump Hills outcrop. The outcrop is an exposure of the Murray formation, which forms the basal geological layer of Mount Sharp. The frames showing the rover in this mosaic were taken during the 868th Martian day, or sol, of Curiosity’s work on Mars (January 14, 2015). Additional frames around the edges to extend the amount of terrain included in the scene were taken on Sol 882 (January 29, 2015). The frames showing the drill holes were taken on Sol 884 (January 31, 2015). For scale, the rover’s wheels are 20 inches (50 centimeters) in diameter and about 16 inches (40 centimeters) wide. The drilled holes in the rock are 0.63 inch (1.6 centimeters) in diameter. MAHLI was built by Malin Space Science Systems, San Diego. NASA’s Jet Propulsion Laboratory, a division of the California Institute of Technology in Pasadena, manages the Mars Science Laboratory Project for the NASA Science Mission Directorate, Washington. JPL designed and built the project’s Curiosity rover. The Curiosity Rover launched on a United Launch Alliance Atlas V rocket on November 26, 2011. At 1,982 pounds, Curiosity is heavier than any spacecraft previously sent to Mars and required a specially designed aeroshell in order to safely enter the Martian atmosphere. The aeroshell, comprised of a heat shield and back shell, was designed and built by Lockheed Martin. The Southwest Research Institute in Boulder developed the Radiation Assessment Detector (RAD), one of 10 science instruments that collect data on the rover. RAD analyzes the characteristics of radiation on the Red Planet. Data will help scientists determine the habitability of the planet.